NAIROBI, 15 January 2015 (IRIN) - Two thousand killed or 150? Controversy surrounds the death toll in the northern Nigerian town of Baga and nearby villages following an attack in early January by the Islamist militant group Boko Haram. A BBC report on the fighting published on 8 January quoted a local government official giving a civilian death toll of as many as 2,000, although it did add that other accounts put the number in the hundreds. Amnesty International used the 2,000 figure the following day in a press release, and despite the caveats strewn through the statement, the number stuck and was taken up by the world’s media. The Toronto Star did a chronology. The town’s regular population was estimated at 10,000 by the official -- although likely to have been far lower at the time of the attack. So Boko Haram “would have had to employ significant resources in terms of both manpower and equipment to be able to systematically execute as much as a fifth of the town’s total population”, Cummings adds. Verifying numbers is hard in such a remote region of northern Nigeria where local media fear both Boko Haram and the army’s antagonism towards reports of their often lacklustre performance. “Local officials, as the BBC quoted, are probably as reliable a source of information as you are going to get,” Cummings told IRIN. Satellite imagery is increasingly a key tool for investigators, especially where access is difficult. Human Rights Watch reported that their analysis of satellite images acquired of the Baga area “reveals evidence of large-scale destruction", particularly in the town of Doro Gowon, the site of the Multinational Joint Task Force base, a few kilometres from Baga. 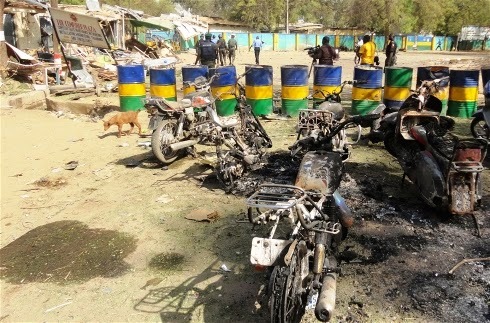 In Baga itself, the rights group estimates 11 percent of the town has been "damaged". With the area still being fought over, "the extent of loss of life and damage to property... will become clearer when the battle is over." Data monitors like the Armed Conflict Location and Event Data Project (ACLED) tally the toll of conflicts. They draw on media and NGO reports -- despite the likely political, economic or regional biases. Clionadh Raleigh, an ACLED researcher, acknowledges the inherent problem with the reliability of the numbers, but says the project uses the most conservative estimates available, is transparent in its sourcing, and is able to revise their datasets on a weekly basis. Differences in methodology and filtering lead to wide differences in estimates. IRIN compared the total reported Boko Haram-related deaths in 2014 from three tracking services. The figures include deaths among security services and militants as well as civilians in incidents only inside Nigeria. IRIN found ACLED’s estimates to be the lowest (at 7,711) compared to two others, the Council for Foreign Relations (11,245) and Nigeria Watch (11,779). In March 2014, there is a difference of over 2,000 between the highest and lowest estimates. But in the case of Nigeria, local press coverage of the six-year crisis has been disappointing – the latest example being the limited reporting on Baga. “The media hasn’t been a major player on the insurgency, on researching the issues,” Abuja-based conflict analyst Hussaini Abdu told IRIN. In addition to security concerns in affected areas, part of the problem is the deeply political nature of domestic media ownership. “A lot of the politics the media is enmeshed in makes it difficult for them to report objectively on what is going on,” said Clement Nwankwo, Executive Director at the Policy and Legal Advocacy Centre. While sections of the media have been merciless in their criticism of President Goodluck Jonathan’s performance in the run-up to the general elections on 14 February, his government’s handling of the conflict has not been a central campaign issue, neither have there been full-throated demands for investigations into the string of military setbacks. There is concern over offending the military. A raid by the army on the distribution centres handling several of the country's leading newspapers in June 2014, at the height of the controversy over the abduction of more than 200 school girls from Chibok, in Borno State, was widely regarded as a warning. Information Minister Labaran Maku advised the media to "define the lines between the urge to report and the need to protect the interest of our nation".